Hard-pressed Scottish farmers will receive a one-off support payment to help with their cash-flow problems stemming from the current low prices for milk and other produce, the Environment Secretary Elizabeth Truss announced today. In Scotland, farmers will share £2.3m. Ministers in Scotland have flexibility about how this money is allocated. The UK’s overall direct aid package is worth £26.2m, the third largest of all the member states. We recognise that many farmers are suffering financial difficulty at the moment and the support announced today will offer some relief. Scottish farmers benefit from the UK’s influence in Europe and they are a vital part of our £100billion food and farming industry. I want to support the industry to become more resilient and ready to take advantage of the growing demand for British both at home and overseas. While it’s right that the immediate focus is on support for farmers’ cash-flow it is equally important that we help build for the long term. Developing a futures market will help farmers manage volatility and we are pleased that the Commission is taking this forward. We are also working with the Commission to look at ways of bringing greater fairness and transparency to the supply chain, using the success of our Groceries Code Adjudicator as a model that could benefit the whole of Europe. 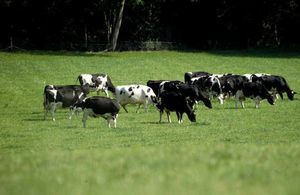 Working with the food industry – including supermarkets, retailers, manufacturers and caterers – on more consistent labelling and branding of British dairy products, improving transparency across the supply chain and allocating more space on shop shelves. This will make it easier for consumers and food businesses to know when they are buying British dairy products. An urgent industry-led review of best practice in the dairy supply chain facilitated by the Agriculture and Horticulture Development Board. The Environment Secretary will lead a trade delegation to China in November including eight British dairy businesses to promote quality British products to this growing market. This visit is part of Defra’s commitment to expand export market opportunities – which grew to a record £1.4billion for dairy in 2014. England £15.5m. The average payment will be £1,820 per farmer.